The villain of The Jungle Book was the tiger Shere Khan, who wanted to kill Mowgli because... tigers are dicks, basically? He thought of all humans as his prey, and was mad that the wolves had adopted (and were therefore protecting) the boy. Since TaleSpin has no humans, he needed something else to focus on; so, like Lex Luthor before him, he became a ruthless businessman, the head of Khan Industries. Shere wasn't the main villain of the TV show - that honor went to Don Karnage and the sky pirates - but he was definitely shady AF. Though he was sometimes helpful, it was mainly when the heroes' goals aligned with his own. Other times he was hiring the pirates to do something criminal for him. 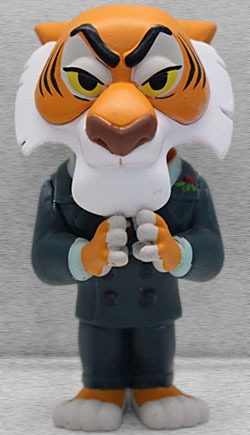 Fittingly, the Shere Khan Mystery Mini looks appropriately sinister. His eyes are half lidded, because he never betrayed surprise at anything that happened, and he's tenting his fingers like Mr. Burns. He doesn't wear shoes, allowing us to see his big tiger feet (he's too anthropomorphic for paws), and the buttons on his suit jacket are sculpted. He's also wearing a tie, if you look behind his hands, but the coolest feature is the little rose sculpted on his lapel. If you turn around and look at his back, you'll see the black stripes painted on his neck. Shere Khan was the rarest of the TЯU-exclusive Disney Afternoon Mystery Minis, being limited to one per case (a 1:12 ratio). If you didn't find him when the case was new, you didn't find him.